Rhinitis is common and can be brought on by a variety of factors. Viruses, bacteria and other irritants can all cause symptoms. Some of the more common triggers include viral infections (colds and flu), changes in the weather, airborne irritants (dust, smog, perfume), foods and beverages (hot foods, spicy foods, alcohol), stress, hormonal changes (pregnancy, menstruation) and certain medications (aspirin, ibuprofen, beta blockers). 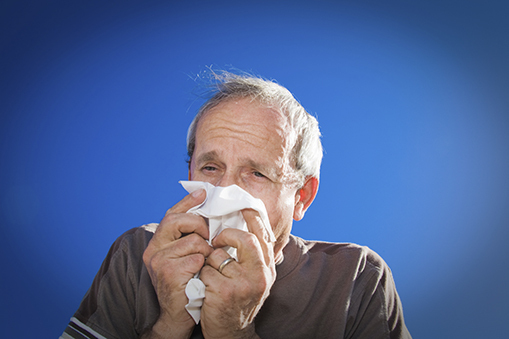 Symptoms of non-allergic rhinitis are similar to those you experience with a cold. Runny nose, nasal congestion, sneezing, headache and postnasal drip are all common, and may continue indefinitely or come and go. Unlike hay fever, non-allergic rhinitis doesn’t cause itchy eyes, nose or throat. The absence of these symptoms is a good indicator that you are suffering from rhinitis rather than hay fever caused by allergies. Non-allergic rhinitis isn’t just bothersome; if untreated, it can cause nasal polyps, chronic sinusitis and ear infections. Your doctor will diagnose non-allergic rhinitis based on your symptoms and medical history, and will want to rule out an allergic cause through skin or blood tests. Sinus problems present similar symptoms, so you may also need a nasal endoscopy or CT scan to rule out nasal polyps, deviated septum, or chronic sinusitis.